Icecream Password Manager is a free software to manage your passwords, credit cards, identities, software licenses, secure notes, driver licenses, passports, bank account and FTP accounts for free. The program securely protects your data with AES-256 leading encryption so there is absolutely no need to worry about the privacy of the created items. The users only need to remember a single master password to access all the saved in Icecream Password Manager profiles and items.Users can enable the synchronization of the vaults created with this password manager via Dropbox to keep the working progress of the program on all the connected devices. 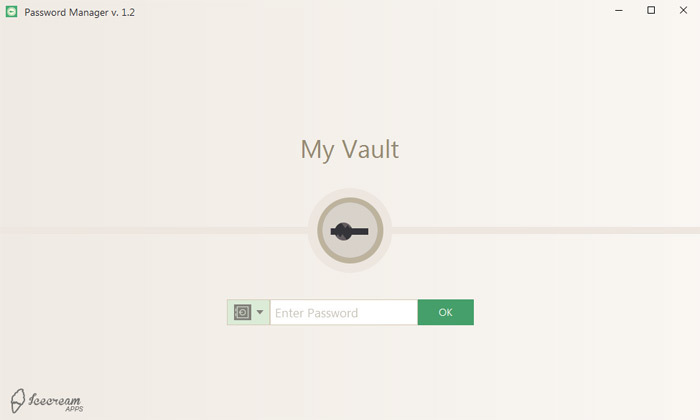 The program supports the creation of multiple vaults for separate users. Autolock of the program within a certain period of time and the feature to clean clipboard automatically within a set period of time that the users can set in the program\'s Settings helps to lock and protect the sensitive information automatically. The feature to create automatic backups is helpful in order not to lose any important information. The backup regularity, the number of the backups to be kept and the path to keep the backups can be manually set in the Settings panel of Icecream Password Manager.This password manages support the addition of the attachments of various formats to the items created in the program. The support of browser plugins is a great way to get instant access to all the stored data right from the selected browser. The built-in password generator will be useful for the creation of new logins and profiles. Automatic form filler (you can both fill or fill and submit forms) of the browser plugins will help to fast login online. With the Markosoft Password Organizer you can reduce the number of user name and password combinations that you must remember to only one by storing all of your logins and authorization numbers in this secure, encrypted, and searchable database.